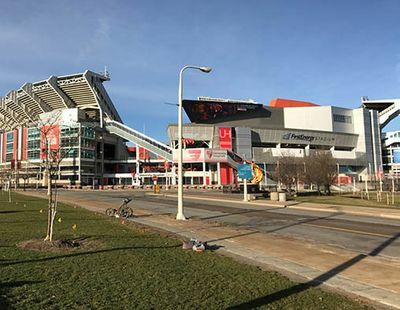 Ground Penetrating Radar Systems was contacted to conduct a utility scan just outside the First Energy Stadium in Cleveland, Ohio. The scope of the scan was to locate any underground utilities for a new pole location that needed to be installed. By using GPR and Radio Detection, a gas line, electrical lighting conduit, and communication duct bank were located in the area of concern. GPRS was able to designate areas to safely install new pole locations. GPR and Radio Detection is an accurate and effective way to locate underground utilities prior to excavation. Give us a call prior to your next project and we will find what’s below the ground. For more information on how GPRS, LLC. can help you on your next project, please contact Micah Stair at (330) 639-8933 or by email at micah.stair@gprsinc.com.